The destruction of the First Temple was the watershed of Jewish history. Despite their shortcomings, the Jewish people took the lessons of the destruction to heart and rebuilt their lives physically and spiritually. The facts of the destruction are simple enough. The prophet Jeremiah had warned of impending doom for years. Judea was living with a false sense of security. They somehow felt that they would be able to rebel against the power of Babylon and sustain the rebellion. They deluded themselves that Egypt would protect them, thinking that their southern neighbor preferred to confront Babylon north of Jerusalem rather fighting them on their own borders. However, Egypt was not willing to spill one drop of Egyptian blood on behalf of Judea. Another delusion was that somehow the Babylonians would forget about them. However, the king of Babylon was not about to let Judea slip out of his orbit. He came with his whole army to put down the rebellion – and he came with a cruelty, a vengeance and a finality. He not only wanted to teach the Jews a lesson, but knock out of the minds of anyone else that somehow you could cross the Babylonian Empire and suffer no consequences. Nebuchadnezzar came from the north and invaded the outskirts of Judea. By the early part of the summer his army had encamped around Jerusalem. He cut off the city and systematically tightened the noose around Jerusalem. On the ninth day of the month of Tammuz the walls of the city were breached and the Babylonian army poured through. Within a month they had destroyed all pockets of Judean resistance. Tens of thousands died in the siege, which brought on famine and pestilence, and then by sword and fire. Those who could do so fled. However, the Babylonians had anticipated that and herded escapees into giant slave camps, from where they were transported into exile in Babylon. At sunset at the beginning of the ninth day of the month of Av the Babylonians set fire to the Temple. The Talmud (Taanis 29a) reports that the fire began at night just after the conclusion of the Sabbath. In other words, that year the day of the ninth of Av itself took place on a Sunday. By Sunday night it was completely destroyed. The ninth of Av became a fast day on the Jewish calendar. The Second Temple, too, would be destroyed four centuries later on the very same date, the ninth of Av. If the Jewish people did not behave like a people meant to represent God – to be a kingdom of spiritual leaders, and a holy people (Exodus 19:6) – what value was the Temple? It was only stone, bricks and mortar. God’s protective Hand, which guides everything in history, was removed. When it was removed the Temple was but an empty shell. “If the owner of the house is no longer there then the robbers can plunder.” That is what Jews mourn over. That is the story, the history. However, to stop there is to not understand what happened. It was not a hard and fast rule of history that the Babylonians had to triumph over Judea. Karl Marx sold Western civilization the idea that there are inflexible and inexorable rules of history, and that the individual under no circumstance could change those rules. Human beings are just pawns. The idea that there are historic forces that create these cataclysms and holocausts acquits one of all responsibility. It is not my fault. I am only taking orders. I am only doing what history says. That is what allows people to be such murderers. There is no individual guilt or responsibility. Everyone is acting under a force. The big have to devour the small. The weak have to fall before the strong. The fittest have to survive. Civilizations have to rise and fall. In effect, if we follow the logic to its illogical conclusion Western civilization is doomed. The Torah has a very different view of history. It can be altered – and it can be changed by one person… by one act… by one people. Just as we are the ones who caused it to happen, we can be the ones to cause it to happen in the opposite direction. We are not guiltless observers caught up in irresistible forces that go by the name “history.” We are the participants. We are the players. We are the authors. The Talmud lists the three behaviors the Jewish people of the time were guilty of that led to the destruction: the cardinal sins of paganism, murder and adultery. Paganism is the lack of any allegiance to the Higher Authority. However, it need not necessarily be translated only in terms of literal idols. It is not just about Zeus and Apollo. It takes on many different forms in society: wealth, greed and all sorts of injustice. All these are the results of having no responsibility to God. Paganism created gods in man’s image. In all the pagan mythologies the gods behaved like spoiled, rich, rotten people. They fought among themselves. They killed each other. They stole each other’s property and wives. They did terrible things because the mythology portrayed the god as man. When large segments of the Jewish people succumbed to paganism they entered the long, slippery slope to all the vices of the pagan gods, which were nothing but the vices of human beings living without responsibility to the Higher Authority. The second sin that caused the destruction of the Temple, the Talmud says, was murder. They placed little value on human life. In our time, too, life is cheap. We become immune to it. Just listen to the news. You are driving in your car and you want to hear the traffic report, but if you do not time it right the newscaster will tell you about three murders, an arson and a brutal beating in the Bronx. We have become desensitized to it. In the Torah, human life reigns supreme. The instances when human life can be taken are extremely limited. They have to meet certain very exacting standards. In a society where human life is taken very easily it reflects just how far humanity has strayed from its purpose. The third sin was sexual immorality. This, too, is the loss of understanding of the role of people in the world. It also demonstrates the loss of understanding of the role of the human body and of the necessity to appreciate the grandeur of inner person, not just the animalistic outer garment of who we are. When one adds those three ills of society together, which the prophets railed against for a long time, the destruction was a natural outcome. However, it was not abstract historic forces that drove the event, but rather the behavior that drove the history. The Jewish people could have done something about it. Indeed, they did do something about it later on, and although there were other reasons ascribed to the destruction of the Second Temple it was not because of the cardinal sins. The Torah idea is that human beings can – indeed, must – do something to improve. The lesson of the destruction of the Temple made that concept real. Despite everything, even in the land of their enemies the Jewish people were able to realize that the Temple could be rebuilt — if not in brick and stone, then in a spiritual sense through spiritual work. Even though the Temple was destroyed, God could find a place in their synagogues, houses of study, behavior — in their very hearts. They would be able to build a Temple of the spirit… until the time would come when God, in His own fashion, would rebuild a physical Temple. Building a Temple of the spirit is much harder to do and a much greater accomplishment. It is much easier to build a building than what is inside the building. The modern world has some of the finest school buildings ever to exist, with all the modern accoutrements to educate the masses, but it is very hard to produce one human being. There are beautiful houses of worship all over the world that are glorious to behold, but it is hard to build a place where God is really welcomed and would want to be found, so to speak. The Jewish people have been able to build miniature sanctuaries (Ezekiel 11:16) in different communities over the centuries in different continents. Although the physical Temple was destroyed the central idea behind it remained and took on greater meaning. It gave the Jewish people strength, courage and purpose. 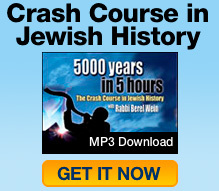 It spelled the difference between general history and Jewish history. No other people have sustained such a blow and not only survived to tell about it but have been able to carry on with their mission. That is why the destruction of the First Temple has to be seen as the watershed in Jewish history. Nothing was the same afterwards. On the other hand, it created new opportunities to work on the inner dimension that had been neglected. They took the lessons to heart, rolled up their sleeves and got down to the business of self-improvement and rebuilding from the inside out. In the final analysis, the way the Jewish people ultimately reacted to the tragedy represented a triumph of the spirit. The outer loss created inner opportunities that they took advantage of to guarantee not only their survival and continuity, but their eternity. Sifrei to Deuteronomy 11:22; see also Sotah 14a.